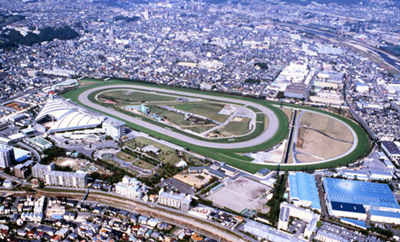 First built on its present location in 1948, Hanshin Racecourse joins Kyoto Racecourse as the second of the two feature racecourses in Western Japan. 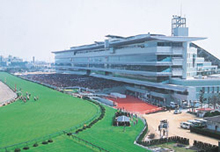 Hanshin has the same number of race meetings as Kyoto and the two racecourses alternate race meeting. The major races are the Takarazuka Kinen (G1), the Oka Sho (Japanese 1000 Guineas) (G1), the Asahi Hai Futurity Stakes (G1) and the Hanshin Juvenile Fillies (G1). Approx. 30 minutes from Osaka and 25 minutes from Kobe Sannomiyausing the Hankyu Kobe Line (in both cases transferring at Nishinomiya- Kitaguchi Station), and approx. 5 minutes on foot from Hankyu Imazu Line Nigawa Station using the special underpass.